It was a real treat to pop by Alexius Yeo’s place. The permaculture educator and practitioner turned his backyard into a productive vegetable urban farm and started a tightly knit gardening community called Project 33, named such because of his house number, and also it began as an initiative to give 33% of their produce to foster community spirit. A while ago, he had a pair of hens but they would dig up his garden and undo the hard work he had accomplished. I took in his hens, but while I loved having them, they didn’t get along with my existing flock, and I had to return them to him after AVA came knocking when a neighbour complained about too much noise in the morning. I learnt later that they had found a veteran chicken enthusiast to care for them. I met Alexius when he was still working at Edible Garden City, but only got to know him better after he had left his chickens in my care. These days, he teaches nature-based educational programmes to schools. Incidentally, our mothers are good friends and ex-colleagues, and I found out after overhearing my mother’s conversation with his mother about our backyards turning into farms. 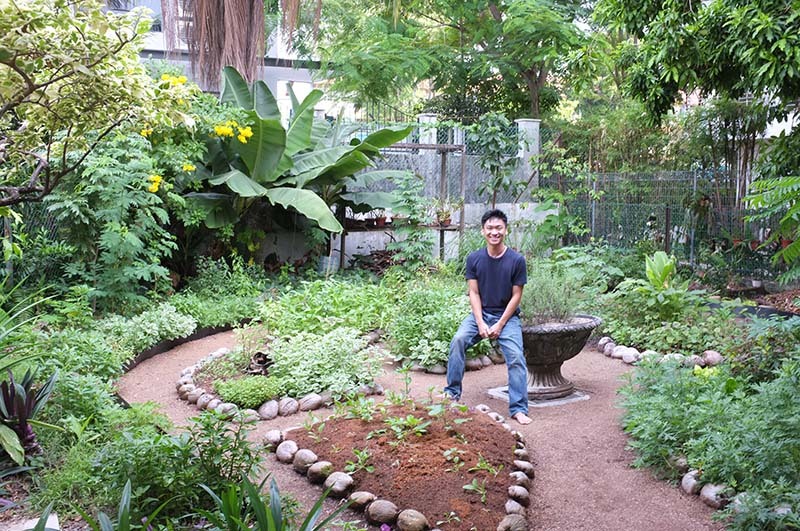 Alexius is one of a growing number of people moving towards an urban homestead lifestyle in Singapore. Other than the monthly Project 33 meetings at his home, which centres around a potluck and gardening workshop and/or activity, he teaches gardening classes like organic pest management, creating a herb garden, and building soil. 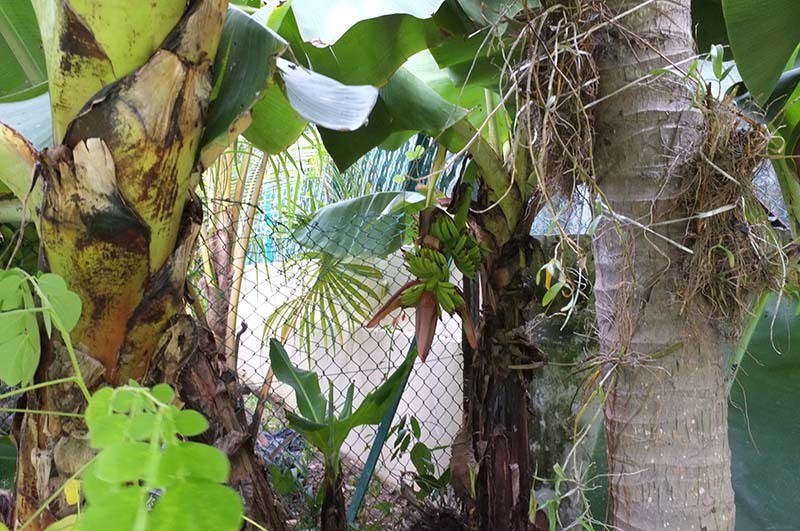 His well landscaped backyard farm includes a wide variety of herbs and Asian vegetables, some fruit trees – even a Chinese date plant, and ornamental plants. In addition, he has a lovely pond with fish and a free range tortoise, a really nice green space to relax. Be sure to pay him a visit sometime! 1. How did your gardening journey begin, and how did Project 33 come about? I picked up gardening from my mom when I was about 7 years old. She loved to garden in the evenings and always got me to help her prune her plants. That’s probably when and how I started developing my green fingers. Fast forward 20+ years, and I found myself in a situation where I wanted to do 2 things pretty much around the same time. The first was to transform my home’s ornamental garden into a productive homestead urban farm. While the second was to begin knowing the people in my neighbourhood. I was looking back one day at how I got to know my ex-neighbours and soon came to realise that all those wonderful friendships started because we gave something we grew in our back yard. I then realised that growing your own food and then sharing it with a stranger was a powerful formula for breaking down walls between strangers. This epiphany ultimately led to the key concept behind Project 33 – which is to create a community of neighbours by using the language of food and by grounding its activities in the true spirit of sharing. Today, at our monthly gatherings, the community gathers for a free workshop about food growing/cooking and it ends with a sumptuous potluck. Through this simple structure, we hope to inspire everyone to re-connect with Nature by learning how to grow and prepare their own food, and to re-connect with one another by sharing what each of us can freely bring to the table, literally. 2. I love what you’ve done to your garden. How long did it take for you to transform it to a backyard farm? What were the challenges along the way? Thank you! It took me about 4 months to complete the earth shaping and landscaping works of the garden farm. Then it took around another 8 months for it to mature and bear an abundant organic harvest. The biggest challenge would likely be trying to find the self-discipline and self-belief to do something rather different – especially when it didn’t bring in any income. I really had to psyche myself into believing in my own endeavour because others could not yet fully understand what all the effort was for. The other challenges would probably include things like creating very good organic soil, pest control etc – common challenges faced by any gardener. 3. You farm as organically as possible, and apply permaculture principles as well. I’m sure it involves more effort and cost, how has it paid off for you so far? Quite the opposite actually. Permaculture directs one to see wastes as resources. And it teaches him/her to model our landscape designs after Nature’s very efficient systems so that we can eventually “design ourselves out of work”. Hence, I try to use cheap waste materials instead of buying expensive ones. 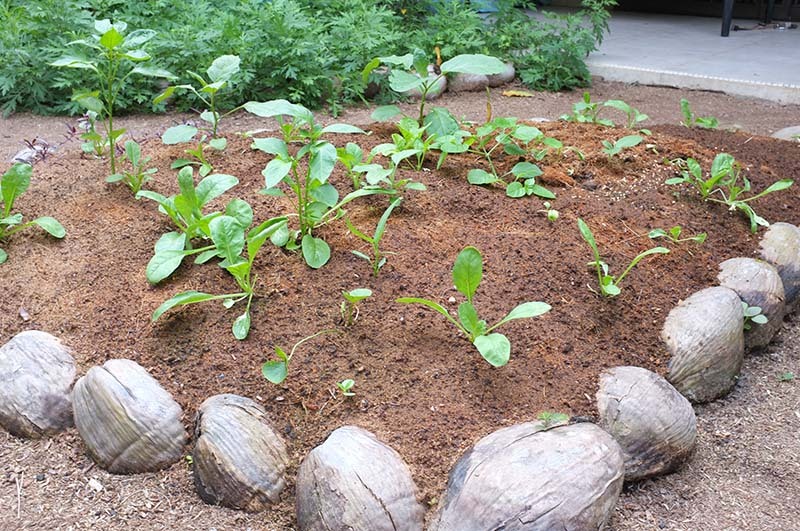 For example, I learned to use saw dust (instead of concrete tiles) to make pathways, and use old coconuts (instead of commercially available plastic edging) to line my planting beds. These are cheap materials that serve the same purpose and more. As for effort, watering and pest control has reduced too because I compost to create humus-rich soil which help to retain water, and I practice intercropping which discourages population explosions among pests. So I guess you could say that farming organically and according to Permaculture principles has actually reduced both cost and effort, and they have definitely paid off in more ways than one! 4. You have some exotic Asian vegetables and vegetable seeds — many I’ve not heard of! In your opinion, what are some lesser known vegetables that Singaporeans should get to know more about? 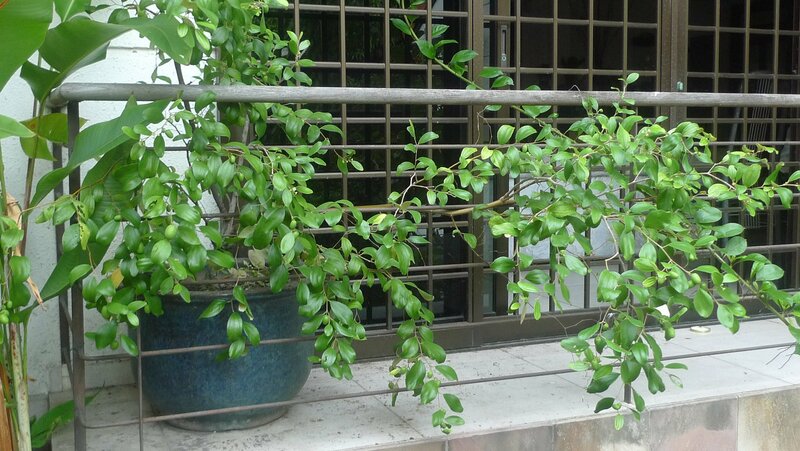 From my experience, many Singaporeans love to grow exotic vegetables and herbs that commonly die because they just weren’t meant for the humid tropics. Many people then give up and say they have no green fingers. I hope to change this discouraging trend by reviving the practice of growing some “lost” local vegetables and easy-to-grow local herbs. 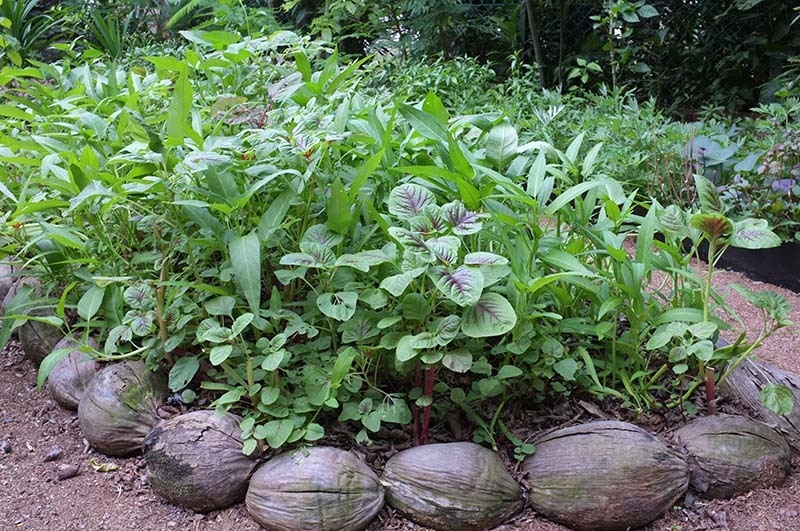 We have a huge number of amazing and super nutritious local plants, like mani cai and mugwort, that urgently need to be re-introduced into the everyday palette and consciousness of Singaporeans. By knowing, appreciating and being creative with local edible plants, we will be one step closer to a more sustainable and confident local culture. 5. Do you have any garden wisdom for those new to gardening? My best advice for someone new to, but passionate about, gardening is to start watching the endless gardening/farming videos that can be found on YouTube. YouTube is such a great source of information shared freely for newbies and experts alike. Secondly, get some real practical hands-on experience and group motivation by joining a community of gardeners/farmers. 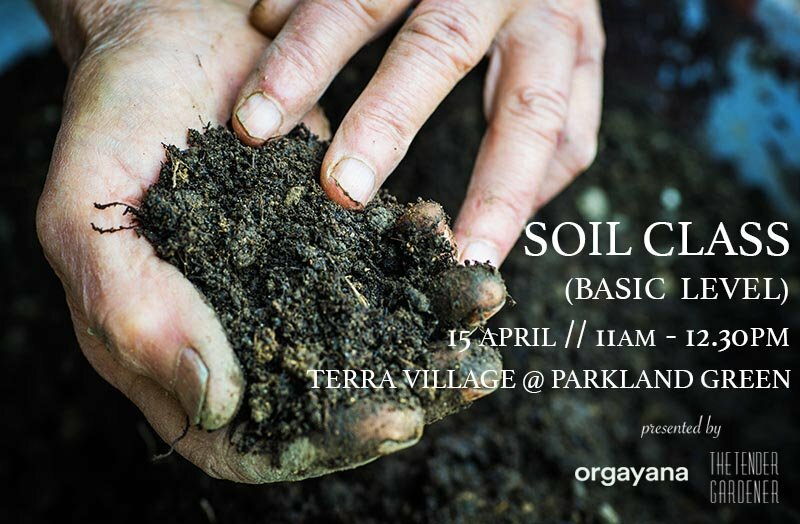 It is very difficult to learn about gardening fast without actually touching the soil. And it is even more difficult to remain passionate about gardening without being around passionate gardeners – people who remind you that you are not the only crazy nut out there. To join Project 33’s mailing list or to get in touch with Alexius, details are available at http://carboninq.com/. Grow Your Own Salad Workshop is back! Really enjoyed the article especially #4.